The best way to understand Daryl Morey is think of Chris Paul at the end of playoff games. There’s nobody more relentless, and nobody more devious, nobody with more stubborn dedication to defy the limits that apply to everybody else. Every angle gets exploited, every trick gets used, and it never stops. But every now and then he gets impatient, tries to do too much too fast, and all that frenetic energy gets counterproductive. The tricks become pointless, and exploiting every angle distracts him from the bigger picture. Trying to do everything leaves him with nothing. For CP3, this happened in Game 5 of the OKC series this year. For Morey, it happened this summer in Houston. So to recap the Rockets' offseason: Traded Asik for nothing, traded Jeremy Lin for less and lost Chandler Parsons. But got Ariza! Yikes. You know how incredibly well things worked out for the Cavs in the past week or so? That’s how bad it’s been for the Rockets. This summer was Morey and Houston swinging for the fences and completely striking out. They cleared the cap space to sign a max free agent, renounced Chandler Parsons so they could bring him back with Bird rights, and … not a single star committed to play next to Dwight Howard and James Harden. LeBron wouldn’t even take a meeting, Carmelo wouldn’t put them in the top three, and Chris Bosh chose to go down with the sinking ship in Miami. It left the Rockets with a choice between locking down Parsons and forfeiting cap space for the next few years, or letting Parsons walk and going into next year with a team that’s worse than the roster that lost in the first round this year. Some of it was just unnecessary. It was one thing to try to get rid of Jeremy Lin and Omer Asik to clear cap space, but once they let Parsons hit the market, the pressure was on to create a title nucleus this summer. They could’ve just paid Parsons around $900,000 to play out his contract, taken their chances getting a superstar, and reevaluated everything next summer. Instead, they were betting that (a) they’d successfully recruit a superstar, (b) nobody would offer Parsons while they recruited said superstar, and (c) they could use cap space to sign that third superstar and then use Parsons’s Bird rights to go over the cap to bring him back. This would’ve made them a title contender for the next three years, but obviously, it came with plenty of risk. 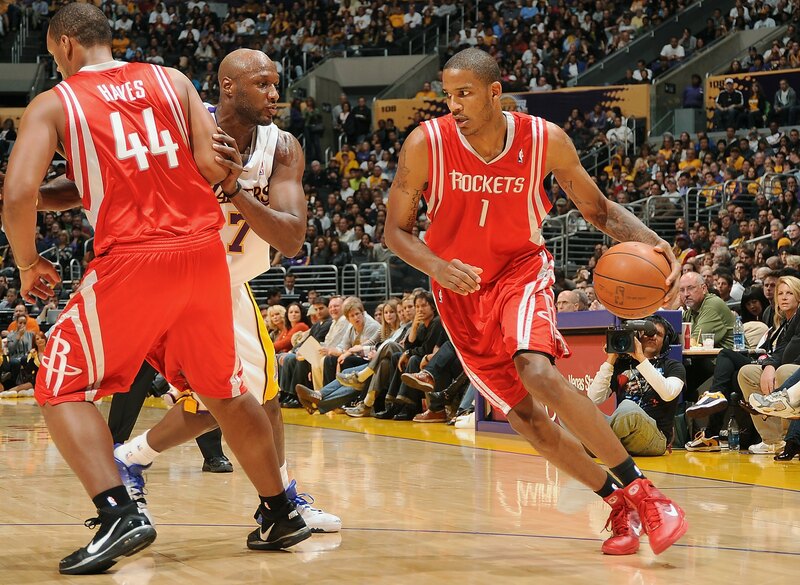 That was before anyone even considered they’d lose Parsons, too, and end up with 30-year-old Trevor Ariza instead. This is why everyone’s making Daryl Morey jokes this week. Or at least that’s partly why. It’s weird to compare an NBA GM to an NBA player, but the world nerds out more and more over the NBA offseason, and a handful of nerded-out GMs are becoming stars just like the players. None of them is more famous than Morey, a.k.a. Dork Elvis, the man at the center of the now-legendary Michael Lewis New York Times Magazine feature about Moneyball in basketball. The problem with that idea in basketball is that “hard evidence” often only creates the illusion of certainty. You may have a better chance of winning arguments with “hard evidence” on your side, but as teams make decisions and fans form opinions, there’s still plenty of uncertainty. Often, data that’s supposed to make things clearer only takes you further from the truth. Just look at this past season’s Rockets. All year long, they were among the league leaders in point differential and offensive efficiency, and the defensive efficiency was a pretty respectable 12th in the NBA. 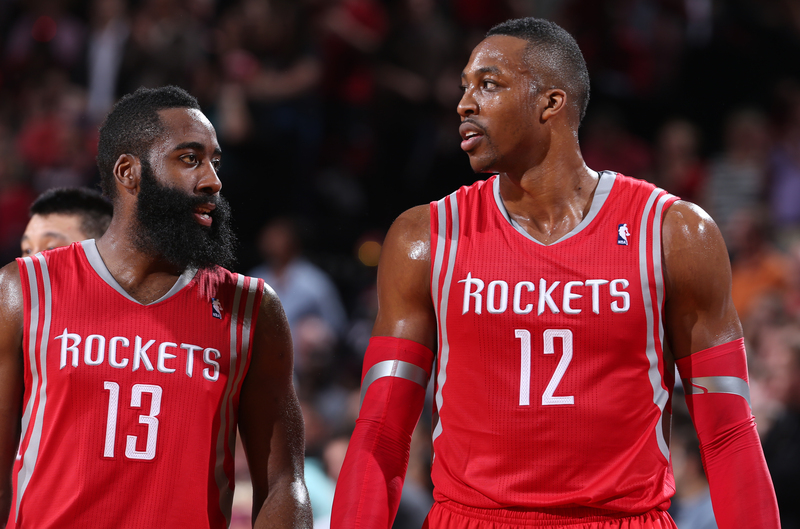 If you were doubting Houston, you were relying on stuff like “Dwight and Harden can’t carry a team” or “McHale isn’t good enough” or “the horrible defense will matter” or “they don’t actually have a starting point guard.” These were vague gut feelings that couldn’t really be proven, and could’ve been pretty easily debunked with all the numbers that said Houston could play with anybody in the West. Then the Blazers series happened. This is why Morey’s actual career has been so much fun. For someone who’s supposed to be the smartest guy in the room, there have been plenty of horrible decisions. Remember when the Rockets chose Jeremy Lin over Goran Dragic and Kyle Lowry in 2012? Or what about the offseason before that? Everyone remembers how the CP3 veto screwed the Lakers, but David Stern also saved Rockets fans from watching Morey impatiently bet the future of his team on Pau Gasol and Nene. Morey got famous as the mastermind who exploits every inefficiency, but the greatest lesson of his career is that you can control only so much. For anyone trying to build a title contender, luck is just as important as assets or expertise. Think about it. After years of trying, Morey did actually trade his way into a franchise superstar — Dwight Howard — but it turns out he landed the wrong one. Dwight might be the only superstar in the league with whom other stars — LeBron and Carmelo and Bosh, at least — have no interest in playing. Houston also stole James Harden from OKC, and it was a brilliant move at the time. Everyone around the league was cursing Morey’s evil genius. Two years later, Harden’s a first-team All-NBA guard … and he’s neck-and-neck with Dwight for least-enjoyable teammate in the NBA, and probably the biggest reason everything fell apart for the Rockets in this year’s playoffs. It’s not just luck, even. As much as everyone can be seen as an asset on Morey’s roster, the Rockets are your most convincing proof that personalities matter in basketball. If Bosh choosing four years with Dwyane Wade over Dwight and Harden doesn’t make that obvious enough, then just look over at the bench in Houston. Morey and the Rockets have made approximately 500 tweaks to the roster over the past few years, and somehow nobody in the front office has had the strength to make the one move that would absolutely make Houston better: firing the likable Kevin McHale and hiring a coach who can actually take them to the next level. I used to be one of the people who loved watching Morey fail. He’s the cult leader of an NBA movement that often oversimplifies basketball and dismisses critics as simpletons. Of course it’s fun to watch him take 10 steps forward and somehow end up going backward. But just for the record, this is definitely the wrong way to look at it. As the years have passed, one thing has become obvious about Morey and the new generation of GMs that followed him. Their trademark has nothing to do with math or metrics. Generally speaking, the one trait that actually sets Morey and the “new” GMs apart from the old guard is effort. They are more creative with the salary cap, more relentless in the trade market, and more ambitious in the long run. People criticize new GMs for treating players like assets instead of humans, as if other GMs are paragons of trust and loyalty. The reason that GMs like Morey do more deals isn’t because they somehow value players less than other GMs. It’s because they’re less complacent than a lot of their predecessors. You can ask real questions about whether all the moves are worth it every summer — and what gets lost when 25 percent of a roster turns over every year — but from a basketball standpoint, Houston’s moving in the right direction. Morey may never actually win a championship in Houston, but in a league with Kevin Durant and LeBron James and the Spurs and (eventually) Anthony Davis, anyone who’s not on one of those teams is working with long odds. Failure isn’t as damning as it seems. Sometimes you just need to go for it and get lucky. That’s what this summer was about with the Rockets. Morey missed, but at least he was going for it. A core of Bosh, Dwight, Harden, and Parsons could have been murderous next year. When it didn’t work, he could’ve tried to save face by matching the Mavericks’ offer sheet and bringing back Parsons, but that just would’ve compounded the disappointment. Parsons will be great at helping the Mavs get to the middle of the West, but bringing him back at $15 million a year wasn’t going to help get Houston from the middle to the top. Instead, the Rockets will save that money and go after someone else. We can all laugh at Daryl Morey’s summer now, but these jokes will likely look stupid in the next year or so. Not matching Parsons just means the Rockets will probably fall into someone who makes more sense. My first thought was that Houston will end up with Rondo somehow, either this winter or next summer. We’ll see. All I know is that I’ve made fun of Dork Elvis in the past, but he’s still managed to turn spare parts into two superstars. He never stops dealing, and never stops working. The biggest reason he’s vulnerable to criticism is because he takes risks. He may get impatient, he may look stupid sometimes, but he never stops trying to make moves that give Houston a real shot at winning a title. It goes back to the beginning. The best way to understand Daryl Morey is to think of Chris Paul. You can understand why his methods aren’t perfect and why he’s not quite what he’s hyped up to be, but even if you want to criticize him when things break down, it’s important to be real about all this. Ninety percent of NBA fans would kill to have him running their team.